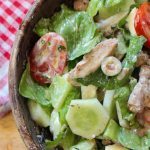 Keto Chicken Salad - Headbanger's Kitchen - Keto All The Way! It’s salad time! And I’ve been eating salads on Keto since I started. It’s my go to meal because it’s a great one bowl wonder. It’s super easy to make and you can pretty much throw it together with left overs form your fridge or you can go all gourmet on it. 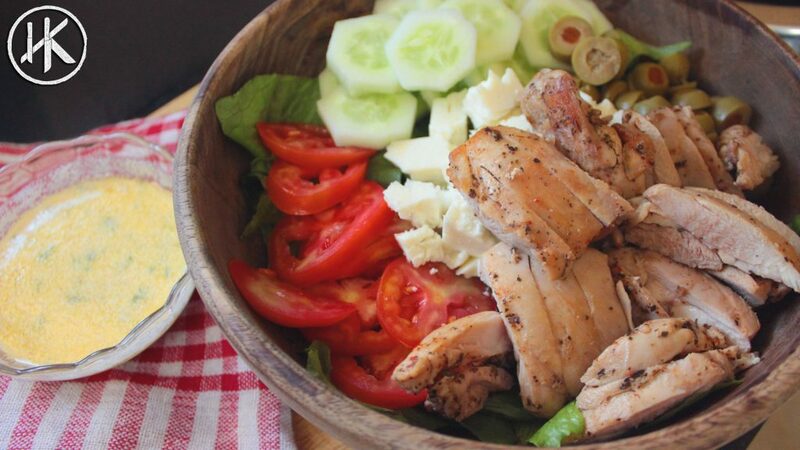 For today’s recipe I’m making a very simple Keto chicken salad. For this salad I’m using veggies I had in my fridge, some cucumber, lettuce and tomato. Some olives and feta (what a great combo) and some grilled chicken. And for the dressing I’m making a very basic olive oil and lemon vinaigrette with a yogurt twist. Now for my American friends, full fat greek yogurt is what I’m talking about, not that fruity stuff you find in your local supermarket. Anyway enough jibber jabber, it’s time to whip up this salad. The great thing about this recipe is that you can cook up a big batch of the chicken and also a nice large amount of the dressings which saves you time. You can pretty much assemble the salad everyday as your meal. I made sure that this salad is really packed with fat. That fat comes from the olive oil and it has flavour from the resting juices of the chicken. It’s the perfect Keto meal, IMHO. And remember, before you eat it, give it all a good mix. Marinate the chicken with salt, pepper, mixed herbs, apple cider vinegar and olive oil. Once cooked remove the chicken and set aside. Make sure you pour out all the residual fat from the pan on the chicken as well. In a mixing bowl take the yoghurt, olive oil, lemon juice, resting juices and mix well together. Season with salt, pepper and cayenne. Slice all the veggies and place them in your bowl. why are we unable to get these recipes on my fitness pal? it keeps giving the error can not log right now. secondly if we search on their database by name even then ur recipes don’t come up. Because I’ve stopped putting them in myself now. You can just add them manually. I’ve written the macros per serving and the recipe makes 2 servings so that means the macros are for just the 1 serving. Love your recipes and YouTube updates. Thanks for the effort. when I add these ingredients to my carb manager..the macros are a bit different, would u say that’s because of different brands ? It’s quite possible. How different is yours?